What Is the Healthiest Deli Meat? If you enjoy a deli meat sandwich, you may be wondering what type of lunch meat is the healthiest choice for your meal. Not all cold cuts are created equally, and certain choices are significantly better for your health than others. Once you know the nutritional differences between your different deli meat choices, you'll be able to prepare a healthier sandwich. 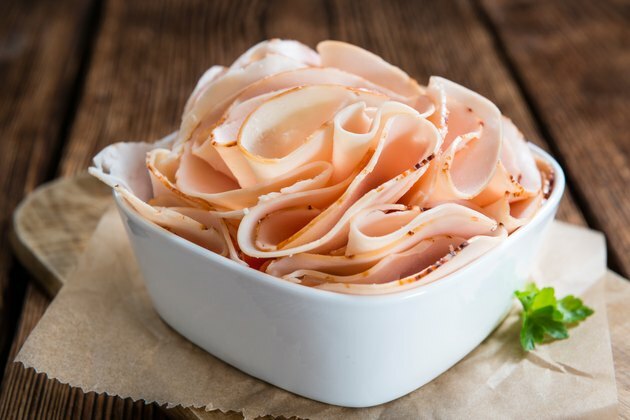 If you're looking for the healthiest deli meat, consider sliced turkey breast, which is low in calories, fat and sodium. If you want to maintain or lose weight, counting calories is one way to accomplish your goal. The calorie count of your deli meat choice is important because you must plan meals that don't contain more calories than you're able to burn during the day. Eating more calories than you're able to burn off through physical activity and exercise will lead to weight gain and prevent you from losing those excess pounds. Turkey breast is your lowest-calorie choice, with 22 calories per 1-ounce slice. Second best is chicken breast with 29 calories per slice. One slice of pastrami has 41 calories, and one slice of ham contains 46 calories. Your highest-calorie choices are bologna with 87 calories per slice and salami with 119 calories per 1-ounce serving. The total fat content is another consideration when choosing the healthiest deli meat. If your diet includes too much fat, particularly saturated fat, you may be at an increased risk for weight gain, Type 2 diabetes and cardiovascular disease. The healthiest lunch meat in terms of fat content is turkey breast, with just 0.35 gram of total fat per 1-ounce serving. Chicken breast contains just 0.40 gram of fat, and pastrami has 1.63 grams of total fat, with less than 1 gram of saturated fat. Ham contains 2.41 grams of total fat and 0.82 gram of saturated fat. Your least-healthy options are bologna with 7.89 grams of total fat and 3.11 grams of saturated fat and salami with 10.36 grams of total fat and 3.66 grams of saturated fat. The 2015-2020 Dietary Guidelines suggests limiting your consumption of saturated fat to no more than 10 percent of your total caloric intake. Most deli meat contains a large amount of sodium per serving. You should not consume more than 2,300 milligrams of sodium per day, and eating a deli sandwich may put you close to this number, depending on how many slices you pile on your bread. Turkey breast once again comes out as the healthiest with 213 milligrams of sodium per 1-ounce slice. Pastrami is close behind with 248 milligrams of sodium. Bologna contains 302 milligrams of sodium, and ham contains 365 milligrams. Chicken breast contains 374 milligrams, and salami is the least healthy of the cold cuts with 529 milligrams of sodium per slice. Look for low-sodium options to reduce the negative effects of added salt. Read more: What Does Sodium Do in the Body? Deli meat is a source of protein, which helps your entire body function properly and supplies you with energy. Salami contains the most protein with 6.08 grams per slice, chicken breast contains 5.16 grams per slice and ham is close behind with 4.65 grams per 1-ounce slice. Turkey breast contains 3.58 grams of protein per slice and bologna has 2.88 grams. Most varieties of deli meat contain around 0.30 milligram of iron, with the exception of pastrami, which contains 0.62 gram per slice. You'll also get small amounts of zinc and potassium from all types of deli meats. Roasted or fresh veggies on their own—load up! Mayo Clinic: Nutrition and Healthy Eating: When Choosing Fats, Pick Unsaturated Fat Over Saturated Fat. Here's How. Does Eating Hot Dogs Have Any Positive Effects? Is It Healthy to Eat Ham?